There are all kinds of fun things today! * It's about time someone has put into words what I've been thinking for ages now. As you may have seen in one of our previous posts, Mary Zimmerman was booed at the Met for her seemingly terrible staging of La Sonnambula. In an age when all you have to do is come out and belch the alphabet in order to get a standing ovation, Terry Teachout of the Wall Street Journal chews on this issue a bit: Why Not Boo? Even when it stings, it beats mindless applause ... or an obligatory standing ovation. "Make that trying to hear. On a recent afternoon I spent about an hour riding up and down in most of the Civic Opera Building's 27 elevators, sampling [Roger] Pines' playlist. Through the whir of the air conditioning system I could make out Luciano Pavarotti singing the aria "Recondita armonia" (from "Tosca"), but only faintly. Now, I know ghosts of famed opera singers are said to haunt the great old opera theaters, but these ethereal whispers of opera in the elevators aren't spooky. They're just dim and dumb." * Anne Hathaway as Judy Garland? Hmmm. I can think of about 4 other people that I'd rather see playing her. But, clearly I am not a certain Mr. Weinstein. Variety is reporting that Anne Hathaway will indeed play Judy Garland in the Weinstein Co.'s stage and film adaptations of the Gerald Clarke-penned biography "Get Happy." TWC recently optioned the stage and film rights to the book, first published by Delta in 2001. Weinstein Co. Executive Ben Famiglietti said it is unclear which version would come first. The stage version would naturally be cheaper and quicker to produce, but some filmmakers could guide both, starting with a film. I'll be interested to see if the quirky Hathaway can pull it off. * I never thought in a million years that I'd ever, and I mean EVER, report on anything Zac Efron did or didn't do. But, here goes... Just days after Variety cited Zac Efron’s attachment to Paramount’s remake of 1984's “Footloose” as proof the Disney protégé was growing up (he's 21), Efron has reportedly dropped out of the film. Although the studio hasn’t confirmed Efron’s reported departure, sources close to the actor say that it’s part of an image revamp. 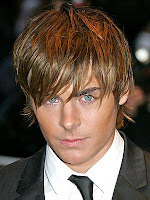 “Zac wants to be in the business a long time — doing more musicals isn’t good for him long-term,” says one source close to the “High School Musical” star. Good luck with that Lil' Zac. * And finally, the "Really? Seriously?" award goes to: [insert drumroll here] Cincinnati Symphony Orchestra Conductor Paavo Järvi. It seems that Maestro Järvi will appear before a judge next week on a drunken driving charge after being arrested early Thursday by Fairfax police. Woops, friends, there's video!